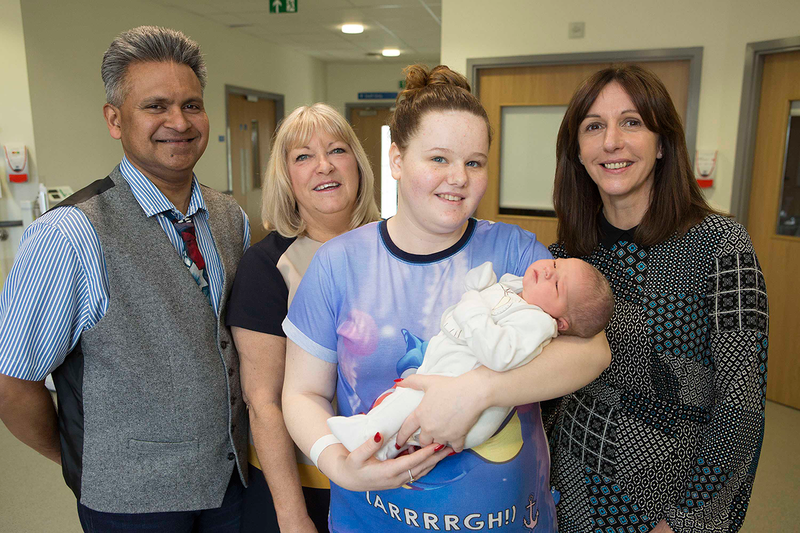 Staff involved in the project, pictured with Katie Wennington and her new-born baby Alyssia-Mai. Northumbria Healthcare NHS Foundation Trust will use their funding to set up a “birth reflection pathway” and collect feedback from women having their babies at the Northumbria Hospital in Cramlington. The trust will use this feedback to signpost women to medical and psychological support if required and shape bespoke training for midwifery teams to improve care. The six-month project complements Northumbria Healthcare’s multi award-winning patient experience programme which is recognised as one of the most comprehensive in the NHS. Women having their baby at the hospital will have the opportunity to share their feedback in ‘real-time’ whilst they are still in hospital. For the first time, this feedback will be attributed to women by name should they wish it to be, ensuring that their experience is the very best it can be for all the family. The new maternity project, which involves collaboration between the patient experience, health psychology and maternity teams, also gives women the chance to share their feedback anonymously at a later date, once they have returned home. Patient feedback plays a key role in understanding the actual experiences of women and their families during their maternity care. It will provide vital information for the trust to determine where and how services can be improved even further. Annie Laverty, Director of Patient Experience at Northumbria Healthcare NHS Foundation Trust, said: “As one of only three organisations nationally to be awarded this funding, we are naturally delighted that our bid has been successful. “A new arrival in the family is a very precious time and yet giving birth can provide very different experiences for women depending on the circumstances. “This is such an important aspect of our care and we’re very keen to understand how women and their partners view their birthing experience. It will provide us with invaluable insight in order to improve care, support our staff and develop our service. Northumbria Healthcare’s patient experience programme ensures the views of hundreds of patients are collected and acted upon every month, while they are in hospital and when they go home. The programme has led to the trust winning many awards including best trust for patient experience in the CHKS Top Hospitals programme in 2016 and the patient feedback forms a key part of the trust’s quality improvement programme. Over 3,000 babies are born at the Northumbria Hospital each year. The Birthing Centre has a midwifery-led unit with a co-located consultant-led obstetric unit. With single en-suite rooms, and facilities for partners to stay overnight, it offers women the highest standards in maternity care and attracts positive feedback from patients. For more information please contact: Jaclyn Curry, Media & Communications Officer, 0191 203 1654 (ext 1654), jaclyn.curry@northumbria.nhs.uk; or Liz Davis, liz.davies@northumbria.nhs.uk.